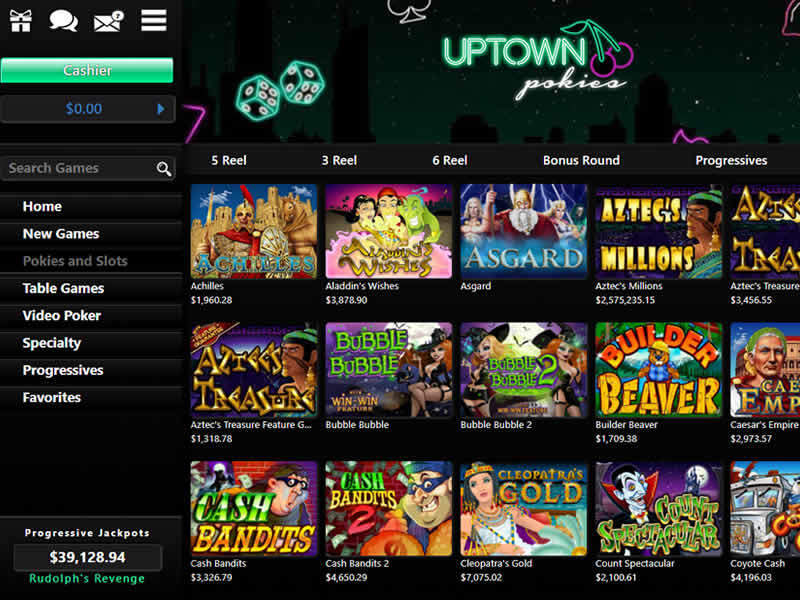 Uptown Pokies Casino is a replica of Uptown Aces – operated by Deckmedia. The gaming venue launched in 2017 and decorated with soft neon lights focuses on the Australian casino market. It offers attractive bonuses and promotion to make its new and existing customers feel more comfortable. You can easily guess from its name that the casino is a “pokie specialist”, but besides a wide selection of pokies, players can give table and card games a try too. No live dealer available. Just like other online casinos powered by Realtime Gaming (RTG), Uptown Pokies Casino runs on an instant-play, download and mobile platform. With a collection of RTG-powered pokies that is constantly updated with new titles, the gaming establishment will provide you with an entertaining gaming experience in a safe and fair environment. Just like its sister site, Uptown Pokies is licensed by the Government of Curacao. Uptown Pokies Casino withdrawal speed is standard for the Australian market – 48 / 72 hours. But in the case you choose Bitcoin to operate, the wait will be significantly reduced to 24hs only – making this brand one of the fastest to pay in Australia! Since this is a new casino in Australia, we would like to give you $10 FREE to try it out with no risk. Feel free to sign up and use this no deposit bonus to check the venue and let us know what you think! We were surprised to see such low weekly limits. Uptwon Pokies Casino is definitely under the average, which is AU$4,000. 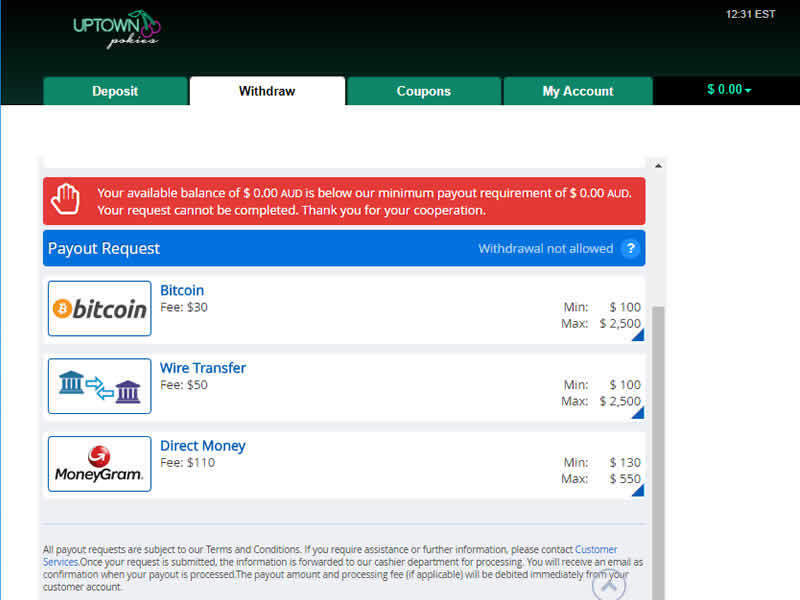 Most of the withdrawal methods available are quite pricey – and the casino charges customers with part of that cost. That’s another less interesting side of Uptown Pokies. We truly hope the casino management will review this police and increase withdrawal limits – and reduce fees. One of the features that can make potential players join a certain casino are bonuses and promotions it offers. To welcome new customers, Uptown Aces offers a 250% match bonus up to AU$ 2,500 on their initial deposit. A minimum of AU$20 is needed for a player to qualify for the generous welcome bonus. To turn winnings from the bonus in real cash and clear them from your account, you have to meet the wagering requirements set at 30x the deposit plus bonus amount. We consider this requirement standard comparing to other Australian online casinos. After they have used up the sign up bonus, players can claim bonuses over their next five deposits, starting with a 150% match bonus on the second, a 100% match on the 3rd through 5th deposit and a 150% match on the sixth deposit up to a total of AU$8,888. Regular players can make use of variety of promotions like one inviting Aussie players to celebrate Australian Day and Summer Luck with up to 225% daily match plus 50 free spins. For every real money wager you make, you will earn comp points thanks to the loyalty programme. Once you collect 100 comp points, you can exchange them for $1 which can be use for play at the casino. To withdraw the money earned from loyalty points, you have to gamble it at least once. As for the gaming content, Uptown Pokies offers a plethora of slot machines you can enjoy for hours. Starting with some of the most popular titles like Achilles and Cleopatra’s Gold, the gaming venue is home to dozens of RTG releases. If you want to have access to the full range of titles, it is recommended to install the download version of the casino. Besides highly popular titles from the Real Series, players can play a number of classic slots too or give some of the latest releases like Fu Chi or Gemtopia a try. You may be familiar with the fact that RTG pokies come equipped with random progressive jackpots, but don’t forget that you can enjoy a thrilling gaming experience with progressive pokies like Spirit of the Inca or Aztec’s Treasure awarding life-changing sums. If you prefer casino games which require experience and certain skills, you can choose from a selection of table and card games like Baccarat, Tri Card Poker or Blackjack and Video Poker variations. Under the Specialty section, you can find American and European Roulette, Keno and Craps. Sadly, no live dealer is available. As mentioned previously, Uptown Pokies is powered by RTG – a company that doesn’t publish their RTP records. Since this casino brand belongs to a reputable gambling group – well known for paying, you can still feel safe depositing and playing here. Even without knowing the RTP, we can still confirm that the games are fair, monitored independently. Many casino players won’t mind, but many others will find this a little odd. If you belong to this group, feel free to check other recommended Australian online casinos we reviewed previously. As we have already mentioned, Uptown Pokies is available across all three platforms – instant-play, download and mobile. RTG is an established software provider well-known for its stable gaming platform, so it is up to you which version of the casino you will access. If you opt for the download platform, you can download software on the casino website and install it on your computer in a few easy steps. The instant-play and mobile versions of the casino can be accessed directly from your internet or mobile browser. The latter is available on Android and iOS devices. 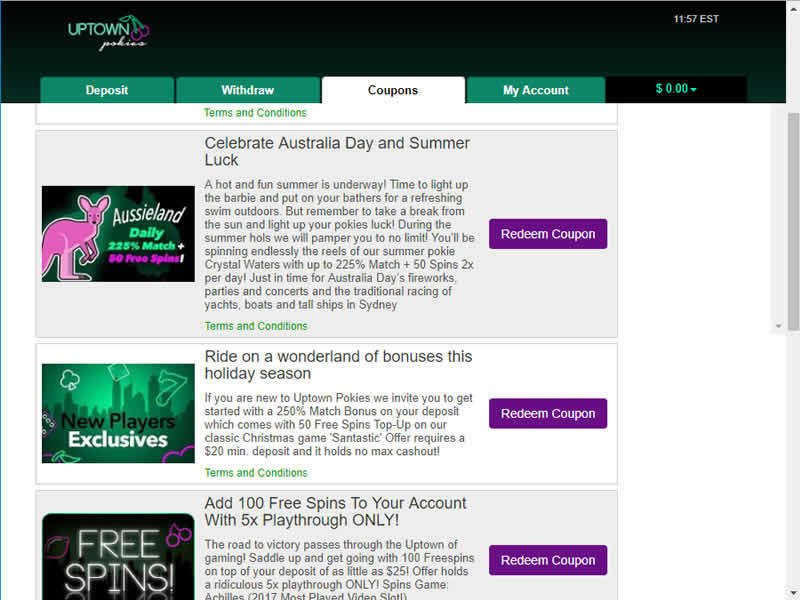 As a recently established gaming venue, Uptown Pokies relies heavily on its sister site, which can be easily seen by browsing any of the sections like Promotions, Terms and Conditions or even Games, where the name Uptown Aces still appears. The two casinos share the same bonus policy and other features, so if you have ever played at Uptown Aces, you know what you can expect from the Australian-facing casino. The desktop casino platform runs in Adobe Flash (bleh!) and relies on pop-up windows to access sections like the cashier and games. If you choose to try this casino, make sure you disable pop-up blockers. With an attractive welcome package which will please both players on budget and those with deeper pockets, Uptown Pokies offers loads of entertainment in a familiar environment. It is a perfect gambling destination for players who love RTG-powered casino games and particularly pokies packed with exciting and lucrative bonus features boosting your winning chances on every spin. Focuses on the Australian Market. Faster payouts using Bitcoin (24 hs). Multiple deposit and contact methods. RTG Powered. Download, instant play and mobile. Belongs to a reputable gambling group. Instant play runs on Flash.